Keto Vindaloo Pork Curry - "Spicy" Indian Recipe - Easy to Make Mild or HOT! 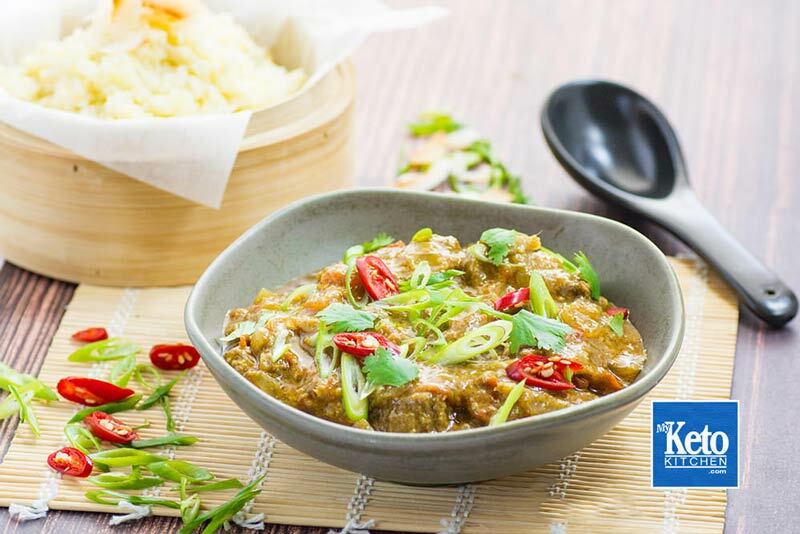 Home » Recipes » Keto Vindaloo Pork Curry – “Spicy” Indian Recipe – Make it Mild or HOT! 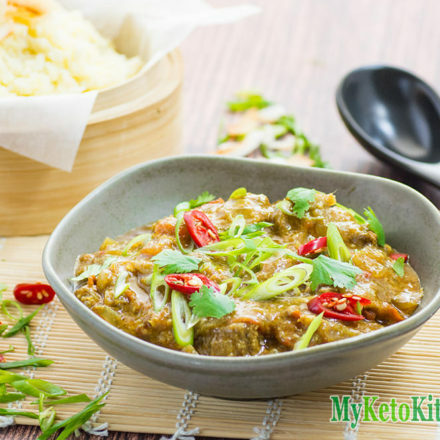 Our Spicy Keto Indian Pork Vindaloo Curry is spicy beautifully tender and hot – in chili that is! If you want a milder vindaloo simply back off on the chili. 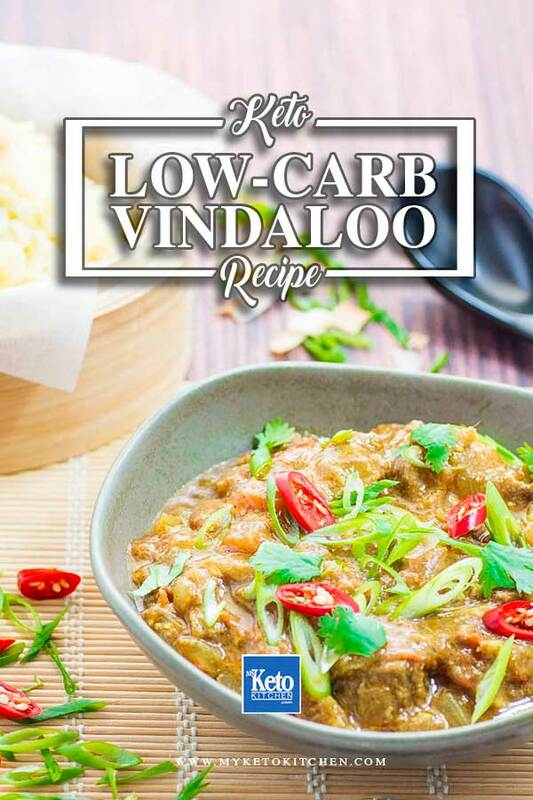 Our Keto Vindaloo is made from scratch but it’s very easy, this ensures no nasty additives or high carb ingredients often found in pre-made packet sauces. Curries are a fun way to mix up your keto recipes and add a little extra spice. Indian Vindaloo Curry has always been one of those recipes to avoid on keto due to the high amount of carbs in it. But we took all of that out. We modified the sauce ingredients and used a nice fatty piece of pork in this vindaloo recipe. The result was this delicious, spicy hot, keto vindaloo curry. We served the spicy pork vindaloo with a side of coconut cauliflower rice. You can also enjoy your vindaloo with this simple cauliflower rice recipe. 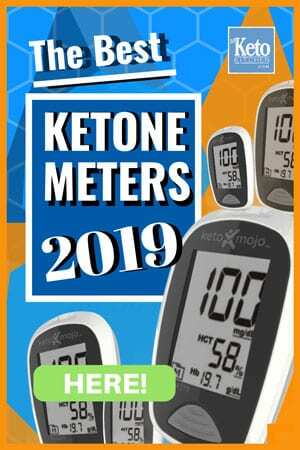 This low-carb keto vindaloo recipe makes 10 serves. In a mixing bowl, place the diced pork. Add the coriander, chili powder, pepper, cinnamon, cumin, cloves, turmeric and white vinegar and mix well. Ensuring that the meat is covered in the marinade. Leave to marinate in the fridge for at least 2 hours, or overnight for best results. In a large saucepan, placed over medium heat, place the coconut oil, onion and garlic and saute for 5-7 minutes. Add the marinated pork and cook for 5-7 minutes, until the pork had colored. Add the diced tomatoes, Serrano Chilies, water and erythritol (if using). Bring to a simmer and continue to cook for 60-90 minutes, until the pork is tender. To make a larger batch of Ketogenic Pork Vindaloo adjust the serving amounts in the recipe card above. I love curry and this recipe looks delicious. The coconut cauliflower rice is the perfect “rice” for this curry. Have you tried a low carb roti? Thank you for your kind words. I have been working on a roti/naan style bread, it’s not far off! Amazingly good, first recipe I’ve tried from this site and it was a hit. I like it a little stronger, spice wise, so added about 1/2 Tablespoon of Red Pepper Flakes per advice from some Indian co-workers. I didn’t have any erythritol so i used a granulated sweetener. Had to use about 3T to get it right but I don’t know if that is due to the switch or my personal spicy/sweet ratio preference. This was delicious! It’s a great recipe, so easy to make.